A Day Dreamer's World: Opinion: "I Hate Twilight!" Wait! Before you start firing at me in the comments! This is only something I hear a lot; not what I actually think. In fact, I decided to write this post because of a discussion I had on Twitter last weekend about the teen romance-series by Stephanie Meyer. I admit, I judged Twilight before I even read it; something I regret now. I thought it would be a silly romance story with glowing-vampires because, it seemed 'cool' to dislike it. This is a similar scenario as you would find in a school! Although - when I finally decided to read the novels last summer - I loved the whole series and immediately regretted the misconceptions I'd made. I understood why people liked this series, why people wanted to get involved in the whole 'Team Edward' or 'Team Jacob' debate and why it has such a huge fan-base. Twilight receives a lot of criticism; all of which I feel is not thought-out before it is said. Just like every-book on the shelf at your local bookstore, there's a chance it will either enjoy it or it will fail to live up to the expectations you had when you first read the synopsis. The Twilight Saga got teenagers and young people reading, especially after Harry Potter came to the end or those readers were looking for something different. You can make any comments you want about how 'silly' Twilight is, or come to the realisation, like I did, that most of us bloggers are here today because of books like Twilight. These books saw teenagers hurrying to the library to grab copies, purchasing them at local shops and more than anything, supporting YA and making this genre popular. One thing I find I spend a lot of time discussing is love-triangles, and whether you love or loathe them, Twilight was the book that started this era! I don't think any of us can resist the urge to pick a 'Team' and, in a way it's a guilty-pleasure of mine! When Stephanie Meyer started these novels, the 'love-triangle' was un-heard of in teen-fiction and when girls got their hands on a copy, they were excited! I even remember, when I hadn't heard of 'Twilight', seeing mentions of Edward and Jacob in magazines that I would read. If Twilight got people reading, it should be celebrated! I feel like it's stereo-typed and shouldn't be. I mentioned above how it's seen as 'cool' to make jokes about Twilight but, I can't help but think about, "What if a person who wanted to read Twilight felt they shouldn't?" What if all books were made out to be one huge joke, when actually they're not that bad? Looking at how successful the books and movies have been, it makes you realise how many people have decided to read them - and as a book-blogging community, some of us may have gotten involved through the franchise. This post isn't to say you can't have an opinion; we're not all going to love every book we read. Of course, I think as a reviewer I understand more than anything how important it is to respect another person's views - I can't count how many times I've read a review of a book where points I don't agree on completely have been made. Although, the book based in the rainy-town of Forks has lead a huge pathway for not only YA but other Vampire-filled pages(let's not mention Fifty Shades of Grey here!). To sum my argument up, despite being full of 'sparkling-vampires', it got people reading! I, for one, will always appreciate Stephanie Meyer's imagination and work for that! For the record, I am Team Jacob! I don't like Twilight, but I guess that's because I've always been a reader: I was just spoiled with so many good books that this was just.. less. Nonetheless I recommended it to my sister who is not such a reader and I know she found it enjoyable. I think it's a bad thing when we try to tell each other what to read and what not to read. We should all make up for ourselves if we are interested in a book or not :) Great topic! I don't think Twilight is the best I've ever read either, although it was the first romance series I read so, I guess that's why I liked it. I loved Twilight and I still do but it's just not a huge part of my life anymore. The vampire phase for me sort of ended. I hate it when someone says "These vampire don't sparkle" I just find it incredibly rude. Author's have different takes on things and that's just how Stephanie Myer portrayed it. I think the movies sort of ruined it for the fandom but I think no matter what it is, there will always be haters. Agreed! Not everyone will love everything in this world...Recently, I've seen so much criticism of Allegiant by Veronica Roth. I just wish people would be more constructive! I actually really liked the movies and am sad to know there's not another one. A good topic for a discussion post, by the way! Everything has the right to express their opinion...I think that's one of the most important things about being a book blogger! I was having a similar topic with my parents yesterday, how some brilliant examples of YA don't get enough 'hype' and this can be disheartening when you know how good it is. I can see why you think those things! I understand that the 'all women need is a good man' element is in there! Thanks, Charli! Having been part of this conversation I agree with you. People are totally allowed to dislike it but I feel some people do just for the sake of it or like you said, because it's cool to dislike it. 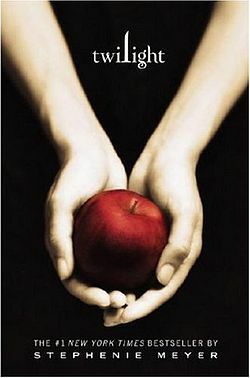 Twilight was one, if the not the first, YA book I read and it got me seriously passionate about reading. So many people at one stage or another had gotten in the phenomena and I think it's silly to be embarrassed of enjoying it. For a long time it was my favourite series and I even enjoyed the movies. Great post Sophie! I agree with everything you've said here too! I think, even leaving the whole Twilight-argument for a minute, it's seen as cool to dislike reading in general. Twilight is one of those books that gets the worst of it when really it's a good series! The Twilight movies are my guilty-pleasure! I really admire you for going and reading Twilight, but I just don't think I ever will! I do own the first book, and I did try to read it, but I was also in the middle of the Harry Potter series at the time, so when I got the next book I may have, sort of, forgotten about Twilight... Now I just simply refuse to read it. I also don't like Vampires that much, which makes me edge away from Twilight even more..but I'm getting better! I promise!! I'm actually reading a book with Vampires in it at the moment...Are you proud?! Really glad to see some defense of Twilight. It's so easy to make jokes about it and say mean things but I've heard of so many people (and quite a few book bloggers) who have said that Twilight was the book that got them back into reading. How can that be a bad thing?